After initial contacts with Amy Scanlon, the City Plan Department historic preservation staff, he brought it to the attention of the Marquette Neighborhood Association Board (MNA) and Preservation and Development Committee (P&D) of MNA as an informational proposal. P&D is a group of neighborhood residents who have met regularly to review and discuss development proposals and infrastructure improvements for over a dozen years. With the general neighborhood approval, Cook then took it before Landmarks, where it was approved. The new floor plans and construction plan included placing a new cast concrete foundation beneath the house to eliminate a host of problems and to create additional quality living space. Entirely new plumbing, electrical and heating systems and finishes were required since there was nothing left of the interior aside from wood subfloors and stud walls. Brandon’s first task was to finish gutting it, then Heritage house movers lifted the house on cribbing while the old stone foundation was removed all within about three days. It was replaced by a poured concrete foundation after which some neighborhood objected to the rear addition. That, coupled with two other things slowed the project for several months — the timing of the new foundation being readied for a construction crew, and, the unforeseen degree of structural modifications for the existing framing. There was a significant amount of dry rot, and an inadequacy of joist framing to support finishing the attic for habitation. In addition, the whole building had a structural twist that had to be corrected, and the walls weren’t plumb. The new windows were installed with the exterior moisture barrier some weeks ago, the plumbing and electrical are roughed in, the insulation and vapor barriers completed, and drywall is in the works. 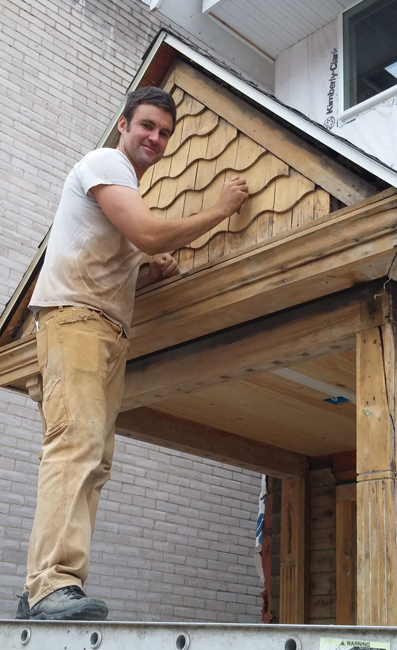 The exterior will feature the original porch, which Brandon handstripped of paint, along with new wood siding and trims to match the originals. Though behind schedule, the project will be completed for leasing in advance of the fall rental season. One apartment will be finished as soon as possible to serve as a model for the second one. 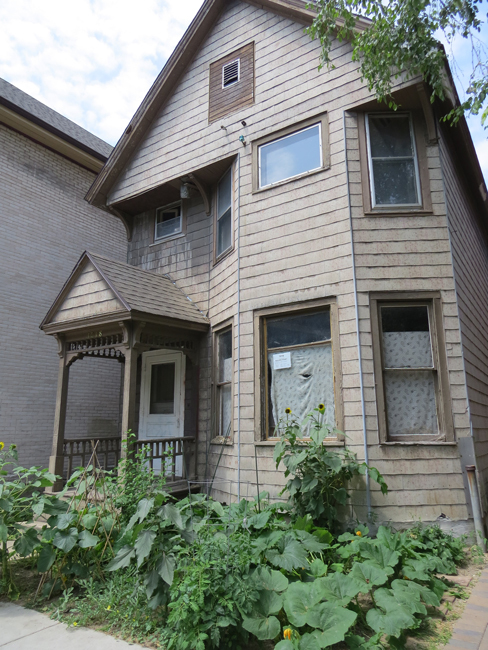 Brandon is also finishing details on a couple other buildings he owns and is working on his own house in the Tenney-Lapham Neighborhood, in which he’s lived for the past couple years. Brandon was born in Madison, grew up in Waunakee, and has lived in Madison for the past seven years, during which time he’s renovated several run-down buildings. He had a very early start. At age 12, he started a lawn care business that he operated for several years. Upon graduating from high school, one of his clients, a builder, offered him a job in construction. “I was like a Swiss army knife – I did everything”, Cook said. Years later, his boss later offered him, an investment share of 40 percent of a small restaurant in Brookfield in a building they were building, and where Brandon seized the opportunity and served as owner/operator/investor. At the same time, Brandon attended classes at UW-Whitewater and UW-Milwaukee for a couple years. The restaurant needed feeding, so Brandon worked to get his sales license and then a broker’s license in real estate, and worked for his boss/business partner for a while before selling the restaurant. Brandon started his own business in real estate when he bought a house Fitchburg to expedite a condo purchase for the sellers. He moved into the house and worked on it to resell it within about 10 months. He looked at condos in Madison for himself, but decided to get a three-unit rental property on Dayton, and launched a new career to work on his own that also provided a place to live. He still owns that rental property along the others he’s bought since. On March 17, a fire broke out in the basement of Sharon Kilfoy’s house next door that houses the Williamson Street Art Center, where she teaches art methods for kids. The fire was contained to one room in the basement, but caused extensive smoke damage throughout. This Thursday, April 28 from 5 to 7 p.m. neighbors are welcomed to an open house at 1018 Williamson to see the renovation in progress. Visitors will be able to see plumbing and electrical roughed in, insulation, vapor barriers and drywall, just days before the walls are closed in with drywall. 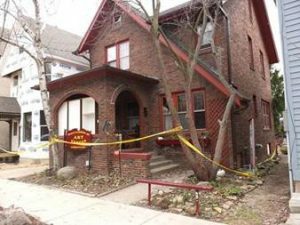 Free and open to the public, it is hosted by Brandon Cook and the Friends of Historic Third Lake Ridge, the Marquette Neighborhood’s history and preservation group. View the photo archives of the Friends of Historic Third Lake Ridge at thirdlakeridge.org and “Historic Third Lake Ridge” on Facebook. This entry was posted in Madison, Madison Commentary, Willy Street, Willy Street Commentary and tagged 1018 Williamson, Brandon Cook, MNA, Renovation, Willy Street Art Center by Gary Tipler. Bookmark the permalink. This is so wonderful to read! I saw him sanding outside and am so impressed with all that he’s doing to keep the integrity of the home, improve the neighborhood, and make for a lovely living situation. Thank you for that comment. I’m sure he appreciates it. Brandon has done a lot of great work for the community. Thanks for the great read!